Isa Vanderbeeker is away at camp, but her four siblings - twin sister Jessie, Oliver, Hyacinth, and Laney - are at home with their neighbor Mr. Jeet when he suffers a stroke. 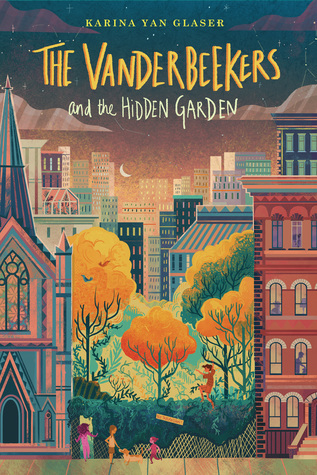 While Miss Josie sits vigil at Mr. Jeet's hospital bedside, the Vanderbeeker kids begin to consider her repeated request that they turn the overgrown lot near the local church into a garden. Once they survey the land and receive (albeit vague) permission from the pastor, Triple J, to begin work, they become extremely enthusiastic about the project, hoping it will bring joy and healing to Miss Josie and Mr. Jeet upon their return to the brownstone. Unfortunately, not long after they begin transforming the space into a garden, developers begin visiting, and it is clear that they have purchased the property for the purpose of building condominiums. The Vanderbeekers do their best to keep on with their plans despite the obstacles that arise at every turn, but they worry about what will happen if their garden is gone before their neighbors get to see it. Though I don't think this series is quite as well-written as some of the family stories of years gone by (The Moffats, The Melendys, All-of-a-Kind Family, etc.) I really appreciate the fact that an author and publisher are still producing books of this type for the families who enjoy traditional children's novels. Like many of its predecessors, this book celebrates kids working toward a goal without assistance from adults, and it shows the benefits of having a bit of a free-range childhood. Sometimes the characters come across as a little too perfect, and even with Isa absent in this story, it feels like each individual Vanderbeeker still doesn't get enough time to develop a distinct personality, but there is still something so endearing about the way the kids work together toward a common goal that will benefit someone they care about. The fact that it's a garden is a bit of a cliche, but that can mostly be forgiven, especially since the book is clearly, at least in part, an homage to The Secret Garden.